THE MUCH-ANTICIPATED (in certain quarters) third interim report of the Disclosures Tribunal landed today, leading to frantic scenes in the country’s newsrooms shortly after midday. It’s more than 400 pages long, and we’ll have reports and analysis on the various findings on TheJournal.ie throughout the day in addition our main piece here on the major findings. 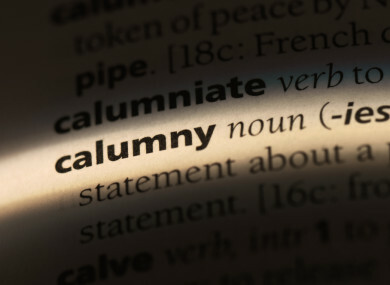 One question that will have occurred to all but the most erudite of readers of today’s report… What on Earth does ‘calumny’ mean? The word makes 27 appearances in Justice Peter Charleton’s report. Most notably, he found that there was a “campaign of calumny” against whistleblower Maurice McCabe by former Garda Commissioner Martin Callinan, which was actively aided by his press officer Superintendent David Taylor. This ‘calumny’ involved Callinan speaking in the most “derogatory way” about McCabe to two TDs and the Comptroller and Auditor General, Charleton found. He also determined that Nóirín O’Sullivan, who replaced Callinan as the country’s most senior police officer, had “no hand, act or part” in this campaign of calumny. If thou dost marry, I’ll give thee this plague for thy dowry: be thou chaste as ice, as pure as snow, thou shalt not escape calumny. Get thee to a nunnery, go. It had been in use in the English language for a while, however, before Shakespeare came upon it. It first entered English in the 15th Century and comes from the Middle French word calomnie of the same meaning. Calomnie, in turn, derives from the Latin word calumnia, (meaning “false accusation,” “false claim,” or “trickery”), which itself traces to the Latin verb calvi, meaning “to deceive”. In terms of modern use, it seems the word is more likely to pop up in the US than on this side of the Atlantic. It’s cropped up a number of times recently in the context of news coverage of the Mueller investigation into possible links between the Trump campaign and Russia. Email “Justice Charleton uses the word 'calumny' 27 times in his report - here's what it means ”. Feedback on “Justice Charleton uses the word 'calumny' 27 times in his report - here's what it means ”.